Here we are the NBA’s Final 4 the conference finals are finally here! Here are the KAT Conference Finals predictions. At the starts of the season almost everyone expected the Miami Heat to be here, but not many expected the Boston Celtics to be in the Eastern Conference Finals. After easily doing away with the New York Knicks the Heat took care of the Indiana Pacers in a tough, bruising series. The Boston Celtics got here on the heels of two long series with the Atlanta Hawks and the Philadelphia 76ers. 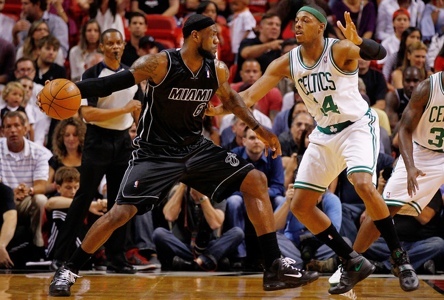 The Miami Heat and the Boston Celtics have another long series in store. LeBron James and Dwyane Wade have been spectacular this postseason, especially in the last round. Those two alone beat the Pacers. The menu calls for more of the two in the East Finals. That being said, it is going to be pivotal for Miami to get solid production from the supporting cast. Without Bosh, Mario Chalmers, Mike Miller and Shane Battier will have to loom large. If they can hit shots from the outside, it will open the court up even more for Wade and James. Defensively the Heat have to slow down Rajon Rondo. That may involve playing Wade on him. For the Celtics it is simple offensively; get the ball in the hands of Rajon Rondo and Kevin Garnett. The Heat will try anything they can to disrupt Rondo but I don’t think they can, and Rondo should be able to pick them apart. Rondo’s main target will be Kevin Garnett. Without Chris Bosh the Heat do not have a post presence, so Garnett should continue is stellar play. When the game is on the line, the ball will undoubtedly be in the hands of Paul Pierce. On the other end of the ball I think the Celtics need to let the dynamic duo get theirs. Wade and James are going to score, it’s the others that need to be limited. Boston did that in the regular season and had great success. The loss of Avery Bradley limits what they want to do with their pressure defense, so Ray Allen will have to pick up his defensive play. All the expert seem to think this series should be a runaway victory for the Heat. At the start of the season Boston was not expected to be a major player but they are. They aren’t expected to win this series, but I think they will. Look for the Celtics to pull off the upset in 7.